Fairly straight forward, but the details are nice and I like the look of it. I so need to build this. GREAT idea. However, mine will have some Four Roses Single Barrel in it! Very nice, but it must have been a really tough job “breaking it in”. If’n a guy was to place a dart board front with a secret latch and a couple of hinges to swing the board away from your brew. It would have made a more of a,,,, “Hidden, Whiskey Stash”. What’ch think ???? Great looking whisky stash! The cabinet doesn’t look bad, either! Very nice, cabinet and contents, little disappointed with the Makers Mark but you can never go wrong with JD’s. I did just pick up a bottle of the Four Roses and must say not to bad at all! looking good, throw a bottle of booker’s in there when you’re done with the JD’s. 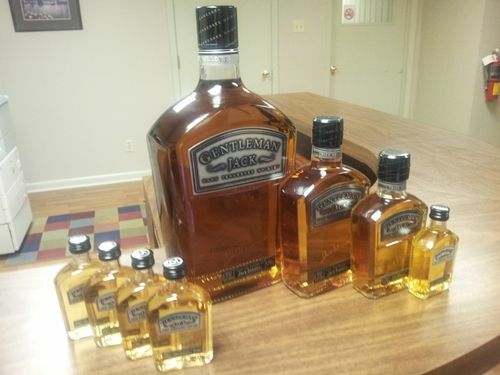 Dude that is some good whiskey. I want to come over to your place! Small cabinets are among my favorite projects.